In the US many tournaments and events actively encourage you to bring along a display board for your army. It helps give the force a cohesive feel, shows off your hobby skills, and acts as a handy way to move your models around between games. I personally really enjoy making them as well. 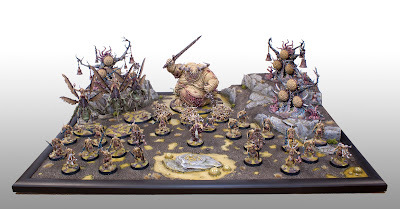 So, what goes into a display board and why would I encourage you to give it a shot? Every model you paint has a base. The base does much more than just hold the model up, it acts as its frame. It gives it a sense of place and purpose. For me, the display board is the base for your army. Not every army needs or warrants a display board and in the end it's really up to you if you want to make one. So far I have made three real display boards and a quickie one for a tournament when I ran out of time on the real one. Two of these actually started as entries for Armies on Parade, which is a fantastic reason to make a display. You can go as simple or as complicated as you want. There are some truly stunning display boards out there that incorporate a ton of detail. Some of the most insane ones have a ton of vignettes in them as well as a lot of height. 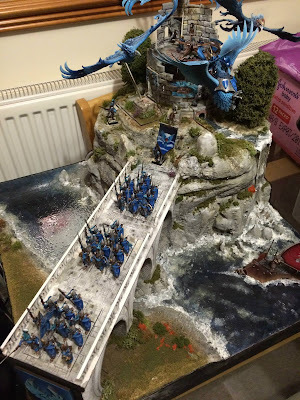 I'm still in awe of Steve Wren's High Elf display board from back in 8th edition. My first display board was for, surprise surprise, my Tomb Kings. I built this back near the tail end of 8th edition and it was solely for entering into Armies on Parade. I was really inspired by the Khemri gaming board at Warhammer World and wanted to capture a similar feeling, but a little more within my scope of skill. I actually documented making that display here. If I recall it only took about a week and a half to build and paint, and has definitely earned back that investment in time. I won a silver at Armies on Parade that year, and used it two years in a row as my display board at Adepticon, where I took home Best Painted my second year. I also use it a ton for photographs, which actually brings me to my next point. 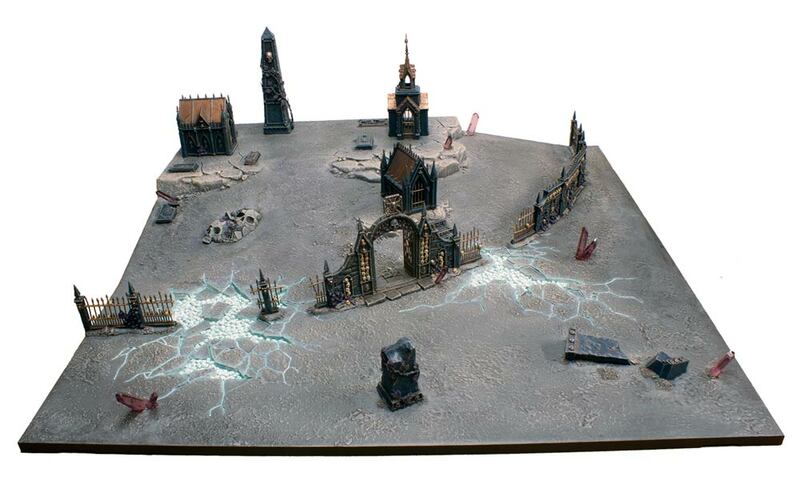 Display boards are fantastic as backdrops for your models for that army. If you like to take pictures of your minis, and want some that look like they're in the setting, nothing beat a display board for that. It'll be tailored to your force, and is generally small enough to move around and manipulate. The average display board is usually no larger than two feet by two feet, since this is the cut off for Armies on Parade. Any larger than that too and you'll have a hard time lugging it around at events. I've used all three of my display boards this way so far and have gotten a ton of use out of them. 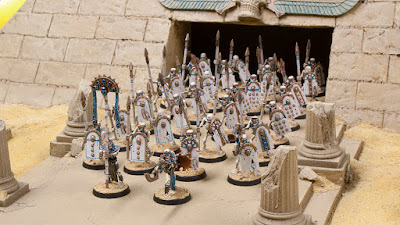 Pretty much every shot of models in the Unofficial Tomb Kings Battletome that I took uses that same display board in different angles. 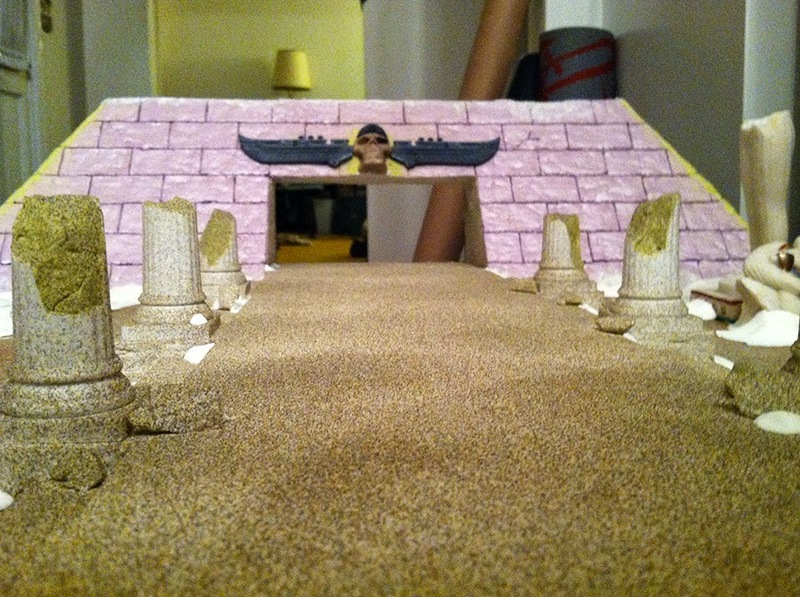 I made the Tomb Kings board out of foam, cake toppers, a piece of wood, and various knick knacks from souvenir shops (I believe the skull in the pyramid was from a gift shop in Germany). 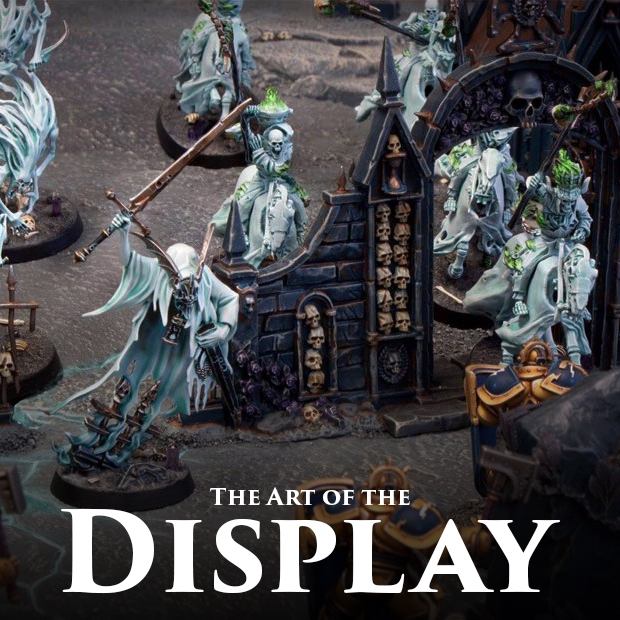 My second major display board was for my Nighthaunt army, which used almost exclusivey GW parts. I have always really wanted to build a board around a Realm of Battle tile, so that was my first box to tick off. This was a really interesting challenge for me, since I had to kind of jigsaw together all of the different kits I was planning on using and make it look natural. This one had a duel purpose from the start, a display board for Adepticon that year, as well as my entry for Armies on Parade. 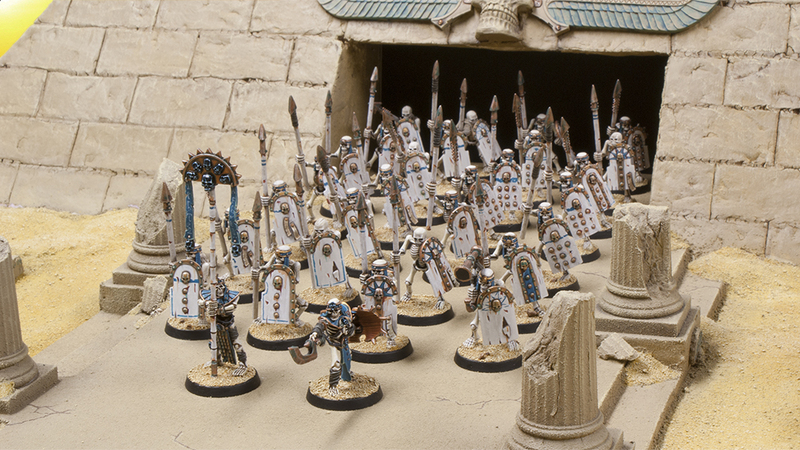 You can read more about me building it on the Warhammer Community site. I had originally planned to take it to the Michigan GT as well, but ran out of time, so I ended up making a quick display board out of a framed cork board, some sand, and an Arcane Ruins kit. It wasn't the prettiest, but it did it's job. This last project is actually what kickstarted my idea for my Nurgle display board. Since my Nurgle army was only 1,000 points for the Adepticon Vanguard tournament, it didn't have to be super big. I once again used the same cork board as the base, but built it up a lot more. I wanted it to match the basing on my army, which meant slime piles, but I also wanted to build some height into it. I have always wanted to try my hand at making some rocks out of pine bark nuggets, and with a little guidance from the master, Steve Herner, I was good to go. I'm really happy with how that one turned out, but I already have plans for a new display board once I finish the full 2,000 points of Nurgle since there is no way that army will fit on the existing one. So, why should you build one? In my opinion, they're a lot of fun to build and paint. They're very different from working on a model since there is a lot of kitbashing and scratch building involved. You have to get creative with the material you use and how you use them. 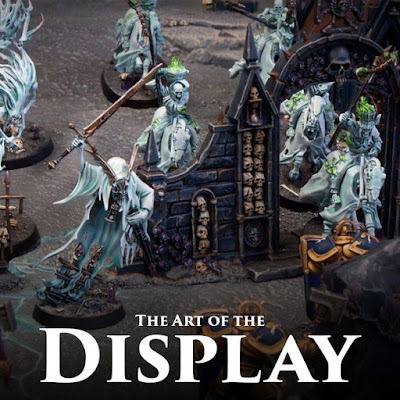 This is great practice for making scenery and future display boards. Since it's scenery you can generally paint them faster. You don't need to spend as much time on the board as you would a mini. In fact, you definitely don't want to upstage your models with the board, since it's there to frame your army. They're great for tournaments, allowing you to move your models around and show them off in style. A lot of US based tournaments award painting points for them as well. 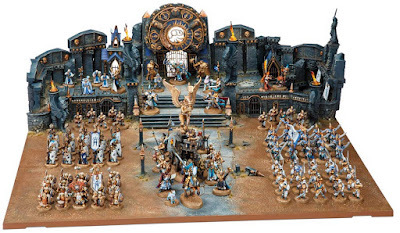 With the yearly Armies on Parade competitions through GW, there's a great reason outside of the tournament scene to give it a shot. Even if you don't win, it's a great feeling being able to showcase all of your hard work in an undeniably cool format. Lastly, they make fantastic back drops for pictures of your models. Just keep in mind when you're building them to leave enough room for all of your models. It's a good idea to plan all of that out beforehand. 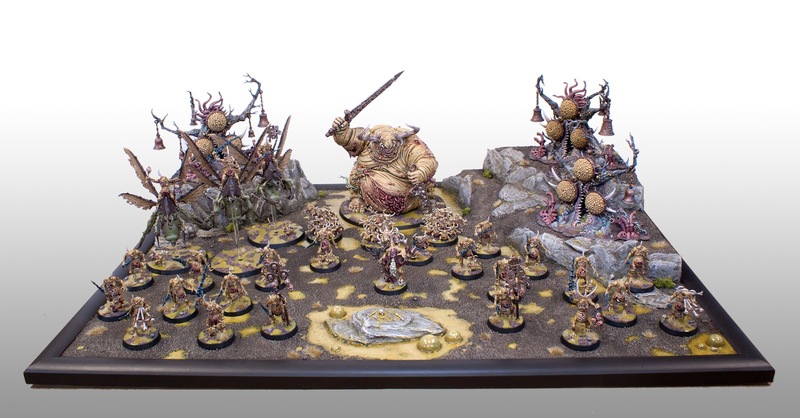 Like I said already, I'm planning on a new board for my expanded Nurgle army, and I wouldn't be surprised if I end up making another one for my Nighthaunt with all the new models coming out. Have you made a display board? What are your thoughts on them?